Trunks: Erect; bark dark gray to black, furrows deep, ridges rounded, short, blocky; wood reddish brown, hard. Twigs: Reddish brown, rigid, sparsely pubescent or glabrescent; leaf scars half-round; buds reddish brown, angular-ovoid, .12 to .48 inch, apex obtuse, scales strigose to tomentose. Leaves: Deciduous, alternate, simple; petiole 1 to 2.8 inches, glabrous or sparsely pubescent; blade elliptic to obovate in outline, 4 to 12 inches long, 3.2 to 6 inches wide, base obtuse to truncate, margins 5-9-lobed per side, lateral lobes oblong or more or less inversely trowel-shaped, tapering or slightly expanded distally, spreading or slightly projecting forward, each lobe with 2-10 teeth, terminal lobe similar to lateral lobes, sinuses extending 2/5 to 4/5 distance to midrib, lobe apex acute, bristle-tipped, lower surface green to light green, brown-tomentose, upper surface dark green, shiny, glabrous. Flowers: Inflorescences staminate catkins at base of new growth, 25-35-flowered, pendent, 2.8 to 3.5 inches; peduncle .2 to 1 inch; pedicels absent; pistillate spikes axillary from new growth, 1-3-flowered; peduncle to .3 inch; pedicels absent. Flowers unisexual, more or less radially symmetric; staminate: sepals 2-6, connate, calyx lobes .07 to .09 inch; petals absent; stamens 4-6; pistillate: sepals 6, connate; petals absent; pistil 1; styles 3. Fruit: October; acorns, maturing second year; peduncle 0 to .4 inch; cup top-shaped, .28 to .55 × .48 to .86 inch, enclosing 1/2 to 3/4 of nut, scale apices spreading; nut reddish brown, ovoid to nearly spherical, .4 to .7 inch, glabrous or minutely pubescent; seed 1. Habitat: Dry, rocky slopes and upland woodlands, often in sandy soils. Comments: Quercus velutina is the only native Kansas oak with densely tomentose, 5-angled buds and acorn cap scale apices spreading. 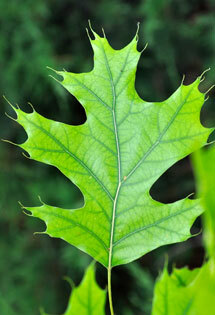 Black oak hybridizes with blackjack oak.